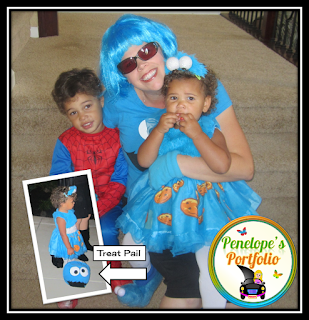 Penelope's Portfolio: 7 Super Easy Halloween Ideas! Looking for an easy and fun costume idea? How about Cookie Monster? I purchased this cookie monster costume for my daughter one year, and paired it with cookie monster slippers. When Halloween was over, she wore her slippers throughout winter. I love making things easy and practical. Score! To compliment her, I purchased an inexpensive Cookie Monster adult t-shirt at a department store. Practical, and in case you were wondering...YES, I did wear this shirt on a regular basis! A blue wig, some inexpensive blue mittens, (which were worn again), added to the look and the costumes are good to go. To complete my daughter's look, I bought an extra cookie monster shirt and hot glued it to a plastic pumpkin treat holder. After all, every kid needs a Halloween trick or treat pail to hold all their goodies in. That completed this fun and easy look! Going to a Halloween Party? Need a quick and easy festive treat to share? Check out these spooky eyeballs! These were so easy to make. Purchase doughnut holes, chocolate chips, red icing, and white chocolate at your supermarket. Simply melt the white chocolate in a microwave and submerge one of the doughnut holes in it. Secure a skewer/food dowel of some sort into the doughnut hole, and push the other end into Styrofoam to hold in place. Push in one chocolate chip to make the pupil. 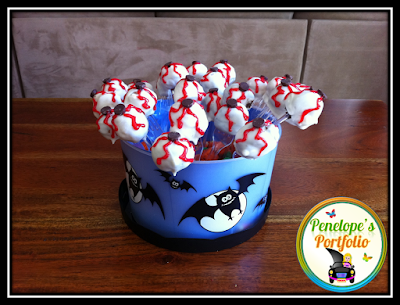 After the chocolate has cooled down and become hard, draw red squiggly lines to resemble blood, and place in a spooky container. Store in a refrigerator until serving. Easy, yummy and fun! I recently helped a friend get ready for her annual Halloween party. Each year, this friend of mine, throws the best party! This year, my friend put me in charge of decorating her mantle. The black star is my favorite. I think it adds a little something extra. My easy decorating tip is to use lots of pumpkins when decorating. My friend just returned from the pumpkin patch and had lots of pumpkins on hand, so I decided to incorporate them into the design. This picture shows the completed look. Speaking of tips, here is a great party activity that takes place each year at her party. The children at her party trick-or-treat the rooms inside of her house. The adults and candy get distributed among various rooms/spaces throughout her house. 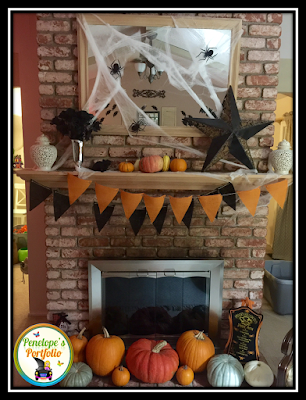 First the kids decorate treat bags, and then tick-or-treat each space/room throughout her house. It's a lot of fun for both the kids and adults! 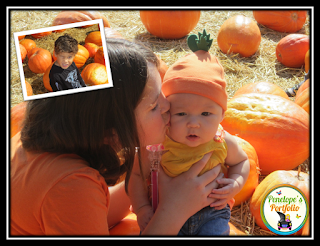 What Halloween season is complete without a trip to the pumpkin patch? If you have little kids to take with you, even better! 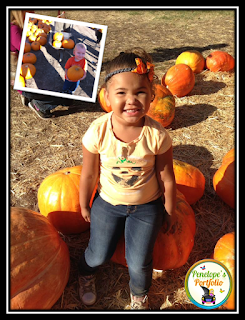 There is something about little kids and pumpkins that simply go together. They make the cutest pics! 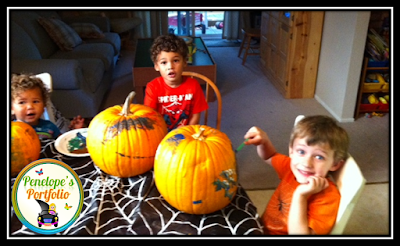 After you are done with the patch, why not let the kids paint their pumpkin? Don't get me wrong, carving a pumpkin, roasting seeds, and expressing your creativity, are always encouraged, but sometimes painting a pumpkin is a little more kid friendly. Just set the kids up with some paint, and let them get to work! 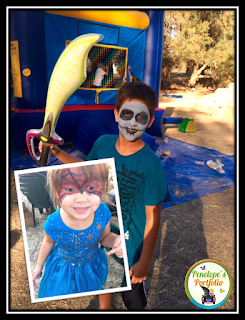 Little kids LOVE to have their faces painted, and truly, one doesn't need to be a terrible talented artist to do it! 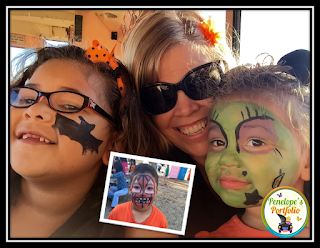 My kids and their cousins recently participated in having their faces painted at a pumpkin patch. The face painting artists were children themselves, and I think they did a wonderful job. Feel free to get inspired by these pictures and paint your child's face in a similar style. Looking to to add something spooky and unique to your party or Halloween decor? Remember my friend who hosted the Halloween party from idea #3? Well, this is another one of her brilliant concoctions. She fills various sized bottles with water and dyes the water with food coloring. 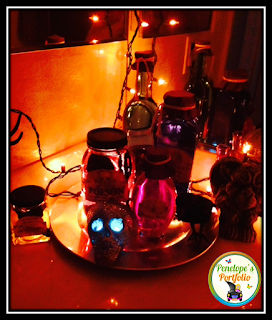 Then, she adds pretend bugs and other creepy creatures to the bottles. 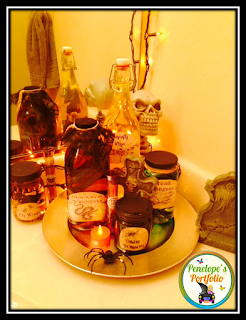 She makes sure the bottle lids are painted to look appropriate, and attaches a spooky label to the front. She displays them on platters for the final effect. They are super interesting to look at, and fun for many ages. Halloween Reward Coupons are here! 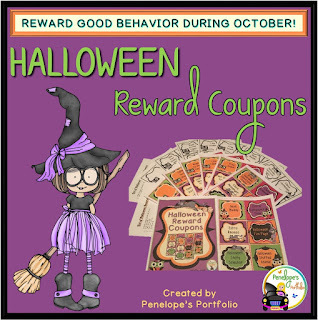 I recently made these reward coupons "Halloween Style". They are great for rewarding positive behavior during the month of October. Children and students will love receiving them. The best part is that all you need to do is print, and pass out the coupons as you see fit. So easy! To see a list of all 36 rewards and a full product description, click here. 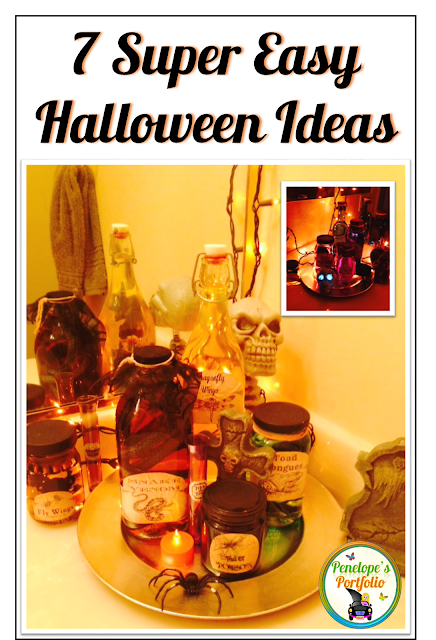 What are some easy Halloween ideas that have worked for you? 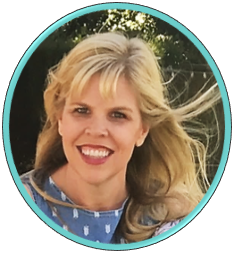 Thank you for linking up at my Teacher Tuesday blog post! I hope to see you back next week. I shared this on Pinterest, so I hope you get a few new views from it. Take care! Thank you for stopping by and sharing this post! I look forward to next week and many more link ups to follow. Thank you for hosting. I will be sure to share your posts as well.